You can find out more about my next book, now titled The Silver Swan: Searching for Doris Duke, on my dedicated Doris Duke bibliography page. After all, death is pretty much the same, for the great or assumed great or small of this world: suffering, loneliness, perhaps a spark of spiritual hope, and then what seems to be the final darkness. Money doesn’t really influence the course of death’s events, especially in Doris Duke’s case, since she died at home at her house in Beverly Hills, Falcon’s Lair, a solitary flyer until the end. Her devoted companion, Bernard Lafferty, officially her butler, was with her, and from this fact flowed three years of legal disputation as the small inheritance—five million out of her estate, left to charity, of 1.2 billion—was wrested away from him in a suit that employed ten lawyers and ultimately cost more than 1 million. The money, of course, was not the issue, either for Bernard in his devotion to Doris (see the great TV special, Bernard and Doris, with Susan Sarandon and Michael Fiennes) for the legal fighting around her estate. Perhaps still innocent of the uses and misuses of power, Doris also left Bernard a seat on the board of the gigantic Duke Endowment, which would have meant his voice would be heard, his opinions weighed and accepted or discredited, in the lofty board room of the great. He lost that position, too, as well as the bequest, and died three years after it was all over, at the age of 51. Before that, on the anniversary of Doris’ death, he was seen on the beach in Hawaii below Sangri la, her magical house, throwing leis into the ocean at the site where he had sprinkled her ashes. 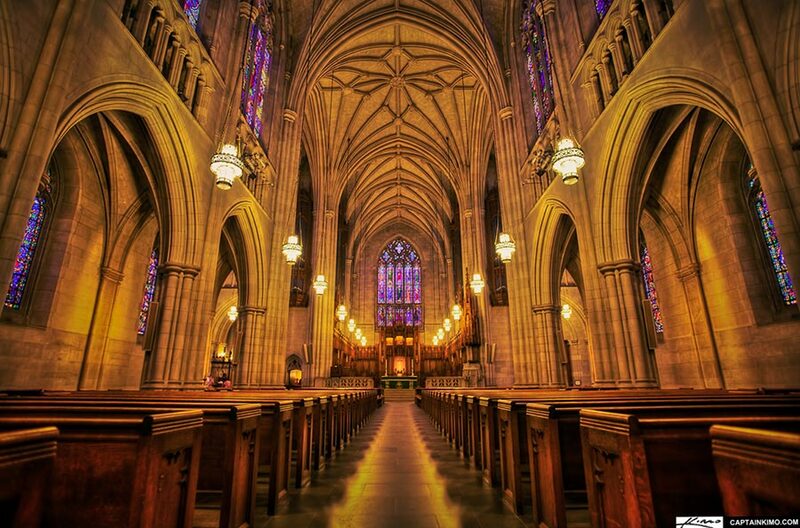 She had not chosen to be buried with her father, grandfather and uncle in the Memorial Chapel at the Duke University Chapel, the towering Gothic edifice most would dub, because of its size and grandeur, a cathedral. Doris did not chose to be memorialized there in a marble tomb topped with her recumbent figure—perhaps in a dance class leotard?—as her male relatives were memorialized in twentieth century suits and ties. Probably she didn’t really have the choice. To this day, there is only one small black and white photograph of Doris Duke on the sprawling campus of the university her father endowed and she gifted with millions of dollars through her will. Only to the degree that the removal of women from the history of our times matters. But she did escape being incarcerated in one of those dreadful marble tombs, which of course have not insured that anyone remembers Doris’ grandfather, Washington Duke, his son, her father, James Buchanan Duke, or her generous haunted uncle, Ben. Tombs never enshrine anything except their occupants’ sense of their own importance, and it seems to me that Doris was never sure of her own importance. For us women, that assurance is hard to come by. But Bernard Lafferty—who cares where he is laid to rest? Who cares whether his memory is used to disparage Doris Duke? “Didn’t she marry her butler?” the young man working in a modest sporting goods store in Newport, Rhode Island, site of Doris’ house, Rough Point, asked me casually. It was the only thing he wanted to know. Nothing else about her life, or her death. Why is it so hard for us to believe love that crosses racial, class or gender boundaries? One of our clichés goes, “Differences attract.” But that seems to mean only differences in personality, or perhaps in height or looks. All the prejudices that continue to restrict our freedom here, in a country that calls itself the greatest democracy in the world, may come down to the young man’s apparently innocuous question. Change, on the personal as well as the cultural level, only comes when we accept that love, in fact, knows no restrictions. These few brief paragraphs about Doris Duke and her butler have peeked my interest in the book. Please hurry and complete it! Only Sallie will tell the truth…look forward to a great read! I first came to know of Doris Duke after reading the life of Barbara Hutton. Both women inherited great wealth at a young age however Ms. Hutton died near penniless. Will be interested in reading your book. So interesting, thanks for this post !! I knew Bernard Lafferty from when he worked for Peggy Lee through to his death. He was as gay as they come, there was no romance between he and Duke, if anything he had this strange obsession with her in that he wanted to BE Doris Duke. He was a crossdresser, he used to dress up for Duke, she found it riotously funny! She loaned him tacky jewellery to wear.